Current research project using nCounters DataLogger plus heel and forefoot sensors for collecting weight bearing (force) data of client inside a robot. Data for each patient can be stored over time to monitor progress providing further feedback opportunities to the patient and treating therapist. 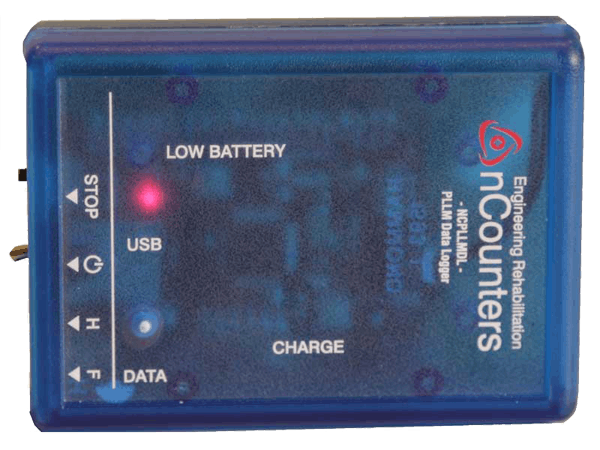 The Data Logger is a portable device that provides reliable, accurate and objective data on balance and weight bearing during gait, standing, sit to stand and reaching activities. The therapist will find the Data Logger easy to set up and simple to use. Ultra thin weight sensing heel and forefoot pads are placed onto an insole and inserted into the patient’s shoe. The sensor pads are then attached to the Data Logger and strapped to the patient’s lower leg. Once the patient commences walking / weight bearing data will be automatically recorded. This data can be logged for an extended measuring time. 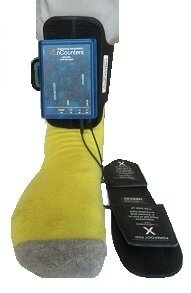 Major upgrade to nCounters Excel macro’s gait analysis software. NOW contains key temporal gait measures, all automatically worked out for you. Swing time, Stance time, Stride time, Step time, Cadence steps / min, %Stance time, %Swing time, %Double support time. Scroll to section of data of interest and get your results on the fly. Take a screen shot and include this data in your patient reports. "Our products are the next generation in gait and movement feedback"